FFA - Convention center cancels Hizb ut-Tahrir America Khilafah (Caliphate) Conference 2012 after concerned citizens protest the radical event. Please send thank you email. It is very important at this time to thank The Meadows Club convention center for having the patriotic courage and moral fortitude to cancel this radical event. It is also highly likely that this radical group is bringing pressure on The Meadows Club to allow the event to move forward as previously planned. 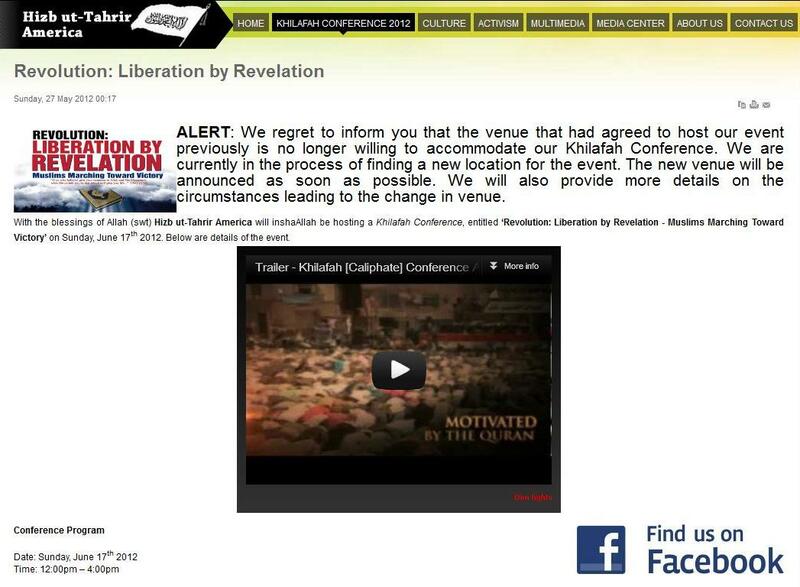 Convention center cancels Hizb ut-Tahrir America Khilafah (Caliphate) Conference. It is IMPORTANT at this time to THANK The Meadows Club for cancelling the engagement. Hizb ut-Tahrir America had scheduled their annual Khilafah (Caliphate) Conference for Sunday, June 17, 2012 at The Meadows Club convention center. THANKFULLY, The Meadows Club convention center cancelled Hizb ut-Tahrir America after receiving emails and phone calls protesting this radical group’s event. Hizb ut-Tahrir America web site states “ALERT: We regret to inform you that the venue that had agreed to host our event previously is no longer willing to accommodate our Khilafah Conference. We are currently in the process of finding a new location for the event. The new venue will be announced as soon as possible. We will also provide more details on the circumstances leading to the change in venue.” That portion of the web page is posted below. Florida Family Association had prepared an email alert scheduled for release on Monday, June 11, 2012 if The Meadows Club did not cancel the event. We are closely watching the Hizb ut-Tahrir America web site for their new venue. A new call to action email alert will be issued if and when Hizb ut-Tahrir America communicates a new location for the Khilafah Conference. Florida Family Association has prepared an email for you to send thanking The Meadows Club convention center for cancelling this radical event.